I have attended the Nutcracker every Christmas since I can remember. I actually performed in it several times as a child (snowflake and party guest in case you were interested) and then started going with my mom, best friend Hannah, and her mother. The very first year I dropped my clipboard on the conductor by accident, as we were sitting in the first row of the orchestra section, dead center. Thankfully, my Nutcracker experiences have matured. I was able to go both Christmases I was in Paris, although the first year the ballet went on strike and I then had to resort to waiting in line in the freezing cold for hours before scoring a 5 Euro standing place. The second time, we got the discount seats so high up and on the side that we couldn’t actually see the scene or the back portion of dancers. It didn’t really affect me, as, let’s be honest, it’s always kind of the same. And then several years I have attended the Lexington performance of the Nutcracker with my grandma, during which I always hope for one of the cute little kids to mess up and make us all laugh. But this year’s Nutcracker was the best, even though I didn’t actually make it to see the show. Because instead of Liz waiting for me on the terrace on the top of the Kennedy center with our two tickets that she “won” at work, was James, who was supposedly and very convincingly on a work trip. And instead of tickets, he had a little box, a perfect ring, and a very important question. Much better than the waltz of the flowers. 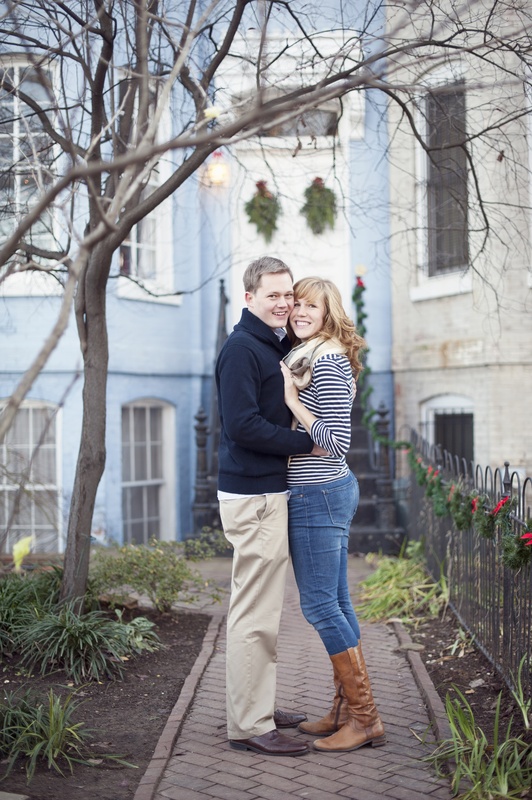 Thanks to Suze who finished our magical engagement weekend with some pictures around Eastern Market and Capital Hill. This entry was posted in Uncategorized and tagged DC, Eastern Market, engagement, love, photography. Bookmark the permalink. Adorable photos! I’m so excited for the both of you…and helping you pick out your dress, Hannah! I am sooooo excited for you two!! AH! Hooray, Hannah and James! Congratulations…..marriage is a great adventure! So happy! And the ring looks so beautiful, although I’m sure it looks even more lovely on your right hand! I meant left! I guess I may be a little dyslexic too. gah what gorgeous pictures and what a romantic proposal! oh you will cherish that memory. best wishes! how exciting! the ring is just lovely and you guys are so cute!